I was working on an eletter article about predictions for the coming month of August. I was not totally comfortable with sticking my neck out with maybe half-baked predictions. I am no Nostradamus. So, I was a bit relieved when I received the summer edition of TCU Magazine. On the cover was a photo of a lawyer named Mac Fulfer and the title of the lead article about his work called What Is Your Face Really Saying? Fulfer and I have more than a few things in common. (I wish I could get his birth information.) Fulfer graduated from TCU in 1971, studied law in Austin, and returned Fort Worth to practice. I followed him in 1974 (after military service in the late 60s), took up medicine in Houston, and never returned to Texas after graduation. Fulfer practiced law for twenty years and eventually turned in a very different direction. I lasted seven years in medicine and have been following my footsteps ever since. My interests have been healing, symbols, astrology, and whatever appears next. Lawyer Fulfer eventually shifted his attention and energies to Face Reading. And now, he is on the cover of TCU Magazine. Imagine that. There may be hope for the rest of us who follow the Less Traveled Road. 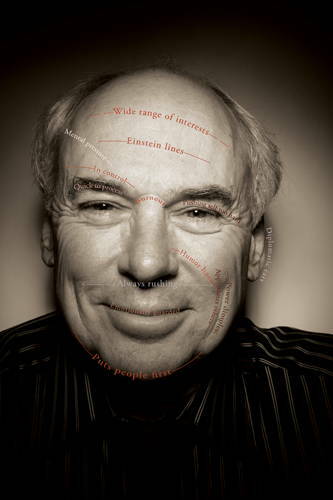 Mac Fulfer has written an Encyclopedia of Face Reading which, along with his speaking and teaching, has been very well received. Fulfer couches his work in neurology and “hard-wiring” pseudo-scientific verbiage that is acceptable to moderns. The old discipline of Physiognomy has risen again and is getting attention. Bravo! Another line like Face Reading (both are on the order of divination) follows. I have a prediction of sorts to share, backed up by hints and ideas from others. You may have your own reflections to throw in. I had considered writing about some aspects of this issue before, but then had second thoughts. Now, I have some further support. Making predictions is fraught with all kinds of problems. It’s easy to be partly right and easier to be all wrong. Or at least seem to be so. But, nothing ventured nothing gained. I have been expecting huge changes in the American economy for years now. (At this point, I think capitalism is dying and following in the footsteps of the demise of communism. Just two decades later.) I have been proven only partly right. American business and government keep creating and spending good money after bad, as they say, to keep the system seem hale and healthy. The problem is the picture is far from accurate. The turn of the century-millennium seemed to be THE time for major upheavals in “the system.” Computer glitches were expected to disturb the whole world. The upheavals came but not as the result of Y2K or financial rearrangements and not in January 2000. Rather because of Mr. Bin Laden and his terrorist friends who chose 911 as an auspicious moment to wreak havoc on the western world. 911 was just a preview of things to come, I believe. The clock has continued to tick towards some even bigger events or scenarios. Another trigger may be just around the corner. The high points follow in bolded italics. I have been worrying about President Obama ever since I read that he watched Osama assassinated on live video. Not a good omen, I have thought. Obama ogles while Osama gets killed. Brother Obama watches Brother Osama being taken out. I have imagined that the three months or so after this episode might be critical. Osama was killed 1 May. Three months takes us to 1 August. Mr. Obama represents the United States of America and as he goes, so goes the country. Obama's charts are not terribly ominous, but concerning. Obama may or may not be in physical danger, but it seems quite possible that Barack Obama could be seriously “wounded” in the coming days. • His 50th birthday is coming very soon - August 4. 50th birthday parties are often crepe-papered in Black. • Chiron Returns to its natal position in just a few months. This could be a year of major healing or major wounds for the President, and the country. It seems more likely that wounding rather than healing are in the cards. 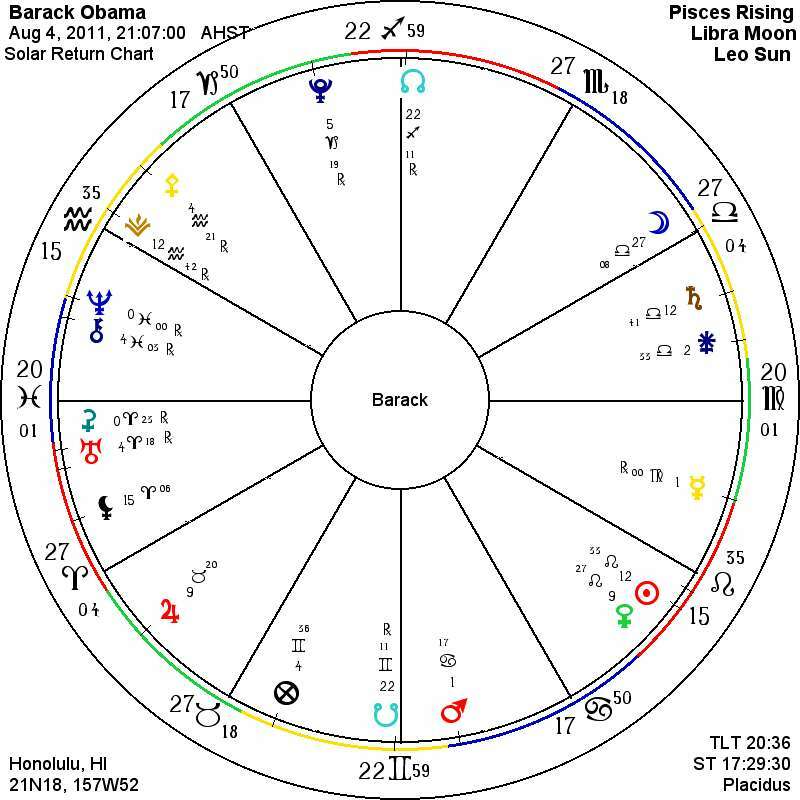 • Chiron has been running close to Neptune in Obama’s 1st house for many months now. This exaggerates his natural desire to be seen as the national healer, when he really - along with other leaders - may be deluding himself regarding his Shamanic and Messianic capabilities. • The North Node of the Moon (Dragon's Head) looms at the very top of his Solar Return Chart. The Node is exactly conjunct the Midheaven in Sagittarius at 22 - a Master Number. The Sagittarius glyph can represent many things, but it seems here to hint at some dazzlingly potent warrior-like energy. Put differently, major change - possibly explosive in nature - is suggested. Transition with a Big T.
• Electric Uranus and other-worldly Black Moon are placed in his FIRST house. • At the same time, the USA is in the midst of its own Saturn Return and the transiting Nodal Axis stresses America's touchy 2nd-8th houses. 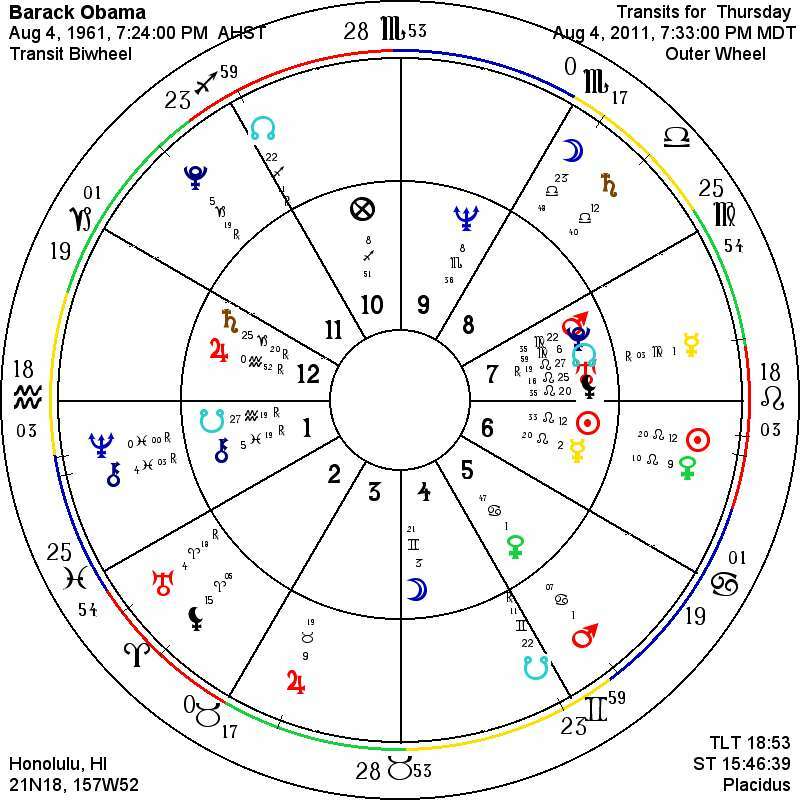 • Regardless of how one looks at the chart, Barack Obama is facing some dramatic "health issues." His own and the country’s. If not terrifying, these patterns are at least very stressful and concerning. And, who knows what else lies in the background? Neptune-Chiron seem to be having wide influence. I wrote Jilly back suggesting 731 might be 7-31. She hadn’t thought of that. Then, we have all the hullabaloo and endless rhetoric and anxiety over the deadline on the US Debt Ceiling marked for 2 August. Which may get pushed back to 9 August or to who-knows-when. Mary Fitz in New Jersey sent me a link to a Youtube astrological program on August 2011. This one caught my attention. It fits globally with what has been on my mind. • August will see the process of dissolution becoming MUCH MORE apparent in the world. Causing great stress, turmoil and drama. 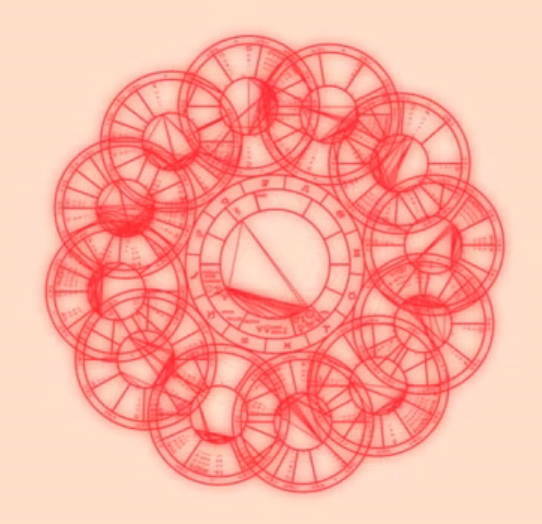 • August 2 will be the center of a SUDDEN OCCURRENCE OF EVENTS NOT PREVIOUSLY THOUGHT POSSIBLE. I recommend you take a look at his 20-minute video. It has a fair amount of astrological jargon, but is very well done and makes some direct and dramatic and far-reaching predictions. "This month's analysis is not for the faint of heart. August's chart indicates one of the wildest and craziest months in recent times." Stay tuned through the month of August to see how Hot and Scary things get.